Highlights over the last year have included his US debut at the Spoleto Festival in Charleston and the Iowa International Trombone Festival, solo tours of China and Colombia and a performance of Takemitsu’s Fantasma Cantos II with the BBC National Orchestra of Wales. In 2018 Rubicon release his first solo CD with pianist James Baillieu. During the 2018/2019 season Peter will give the UK premiere of James MacMillan’s Trombone Concerto with the London Symphony Orchestra at the Barbican Centre London. As a soloist Peter has appeared with the BBC Symphony, BBC Philharmonic, Ulster Orchestra, Thailand Philharmonic, Barcelona Wind Symphony and Lucerne Symphony orchestras, among many others. 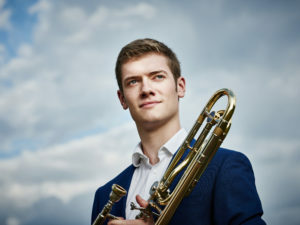 He has given recitals at Wigmore Hall (as soloist, and with Alison Balsom), the Barbican, Hay-on-Wye Festival, the BBC Proms in Melbourne Australia and Kumho Art Hall Yonsei in Seoul. Peter was selected by the Young Classical Artists Trust in 2014. He is a Yamaha International Artist.